The original Paducah Chiefs began playing baseball in the Kitty League in 1903. Over the years, the team was disbanded and restarted on numerous occasions until 1955 – the minor league team’s final year. In the second half of the Chiefs’ 52-year existence, Brooks Stadium was built to be their home field. And finally, after 60 years, Doc Hideg Field once more welcomes home a Paducah city team. As a nod to its predecessor, the Paducah Chiefs returned to Brooks Stadium in 2017. This time around, the team is part of the Ohio Valley League, a collegiate wooden bat association. A large percentage of the 26-player roster is comprised of players originally from the Paducah area. The players who don’t call the city home are housed by host families for the duration of their 40-game season. As the City of Paducah’s only team of any sport, the Chiefs are an opportunity for the entire community to unite and rally behind a common cause. The team is overseen by Brooks Stadium Commission President Doc Hideg and General Manager Greg McKeel. The Chiefs are in good hands on the diamond as well under Field Manager and Paducah native Joe Hall. Hall spent three seasons playing Major League Baseball and later earned a World Series ring as a hitting coach for the White Sox. 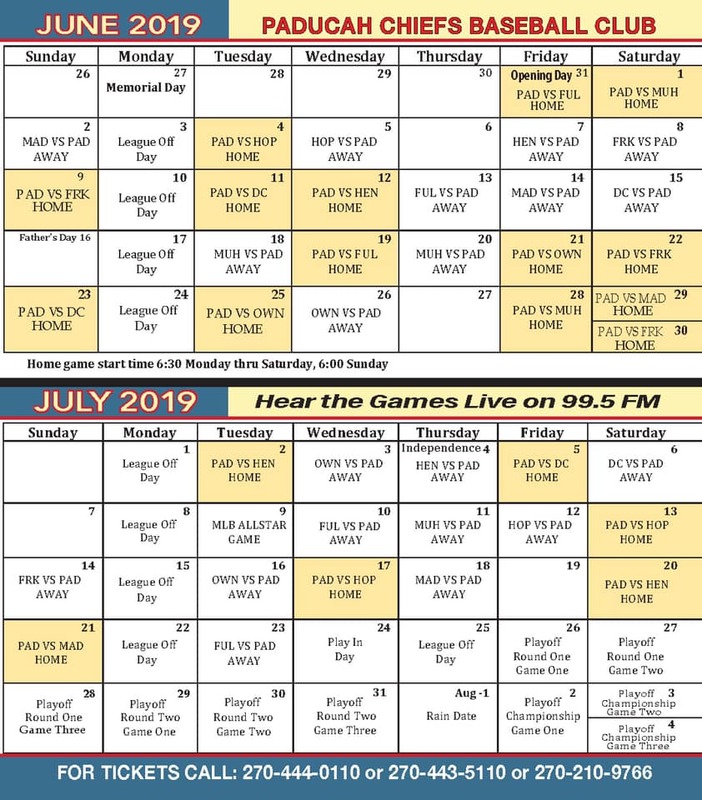 The Ohio Valley League season runs through the summer months of June and July. The Chiefs play approximately half of their games at home. To follow their success, check out The Paducah Sun for daily box scores and local TV and radio stations for additional information. Additionally, the Brooks Stadium Commission is always looking for companies to be corporate sponsors and families to host Chiefs players. Contact team administration for more information.